I am not pointing out a problem, but that Ubuntu can be used with less memory as possible. Most complain that Ubuntu uses about 1.2GB at idle at boot. I am using Dingo, quite naturally, because when it is out there, I don’t find any reason to use Bionic – living dangerously. I am using Dash to Panel, rather than the D2D or Ubuntu dock. Is the rewording of the topic all right? The topic wording still says “1.2 MB” which I assume is just a typo and should say “1.2 GB”. Aside from that, yes I agree some people do complain about memory usage only because memory usage is a confusing topic and different tools will measure and report different memory-related metrics. And regular users who aren’t computer scientists often don’t know the difference between them. In the screenshot above, the number 646M shown by htop is indeed the amount of physical memory in use for the entire system. If you look at the list in the same screenshot though you will see only 140M of that is from /usr/bin/gnome-she (which I assume is “gnome-shell”). However those numbers are both RSS (resident set sizes) and so may change according to how busy the overall system is, even if gnome-shell itself doesn’t allocate anything new. I think a more stable and accurate measurement of memory allocated by the program actually can be found in /proc/PID/status as VmData. But regardless of what tools you use, it’s important to avoid the beginner’s mistake of judging a program by its virtual size. A virtual size (VIRT in htop/top, or VSZ in ps) is not a measurement of memory used, but a measurement of virtual address space allocated. Indeed if anyone measures system impact using VIRT or VSZ then they are mistaken. That all said, you also can’t judge a program by its RSS (RES) either (140M in the screenshot) because the kernel is entitled to trim that down to zero at any point, which is not an indication of a more efficient program. It would only indicate that the overall machine is running out of memory. There lays the real problem… all of htop, top and ps by default report the two metrics that are not accurate measurements of program performance. So of course many people are going to get muddled. To actually measure what a program is doing you need to look more closely at /proc/PID/status or elsewhere (like decoding /proc/PID/stat or /proc/PID/maps). Considering that Windows10 allocates more than 3GB on a fresh start, I’d say 1,2GB is quiet slim. I think comparing ubuntu with the gnome DE to xfce or something is quiet unfair, comparing what features DEs like xfce lack and how the overall look is. We shouldn’t compare Windows 10 to Ubuntu at all – different worlds. But we should compare the different Ubuntu derivatives among themselves (even with those that were once). 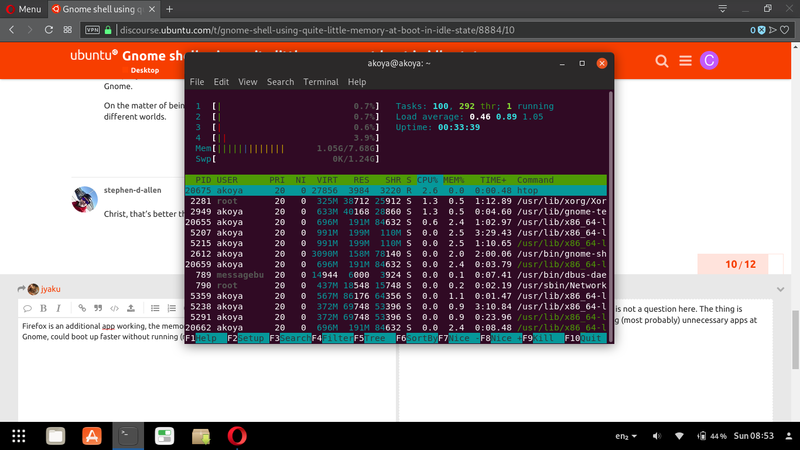 If you were to compare the Gnome DE with another, that would be Ubuntu Budgie, as it is based on Gnome. On the matter of being fully fledged and snappy, I’d choose Kubuntu, then again Gnome DE and KDE are of different worlds. Christ, that’s better than I get in fvwm, which after login sits around 960 Mb! 960 MB is the my htop value with gnome-shell, ubuntu-dock, desktop-icons (nautilus 3.30) tracker and htop active on my updated cosmic install. FIrefox raises that to1,5 or 1,7 GB with 2 tabs open. Firefox is an additional app working, the memory it takes is not a question here. The thing is Ubuntu with Gnome, could boot up faster without running (most probably) unnecessary apps at boot. I have no idea what those apps might be. Additional background apps working mean, battery would get drained faster. Here’s a screeny of Htop with the Terminal (doing the daily upgrade) and Opera on. This even takes less memory than Unity with Dingo I have. The laptop is more than 4 years old and with a Pentium processor. I forgot to mention that providing your machine has no swap files/devices (see /proc/swaps), then you can use the above RES (also known as RSS) values as fairly accurate measurements of applications’ memory usage. I just test the DE, but would be not using the Gnome-shell as the daily driver. I just wanted to show that it can be made to use less memory at the start. Using many background apps (known or unknown, most probably unnecessary ones) eat up the laptop battery, so they should be taken off. That’s up to the devs. If Ubuntu uses 1.2 GB at the start and keeps on using it all the time, it’d just drain the battery. The thing is Ubuntu with Gnome, could boot up faster without running (most probably) unnecessary apps at boot. I have no idea what those apps might be. I don’t really understand this statement. Do you have the feeling that there is some unnecessary load, but you can’t find what is it? I wrote earlier that I’m not sure what they are. Only, if the standard Ubuntu boots using 1.2 GB memory, and the non-standard Ubuntu with Gnome shell boots using ~0.65 GB, then some extra apps must be working. No, it is not a comparison between Bionic and Dingo, but between standard Ubuntu 19.04 and non-standard 19.04, same DE after all. Same DE, Gnome shell. Standard Ubuntu comes with 2 system extensions; Ubuntu Dock and KStatusNotifierItem. The non-standard is Gnome-shell with whatever extensions you need without those 2 system extensions. Sometime ago Ubuntu had its own DE, something exclusive, but now it has a DE that anyone can have with any base, Arch, or Debian or whatever. The extensions are also for any distro with Gnome shell. Even those 2 Ubuntu system extensions can be installed in any other Gnome distro, even though they are not available at extensions.gome.org, just copy and paste. Alright, this is what I missed! If this is the only difference, we might have some insights about where the “issue” is. Its also better, if there is an ability to add text files to the desktop and add to desktop any apps. You can see that here and here, I could get that to happen by playing with 2 different Gnome based Ubuntu derivatives.